The old saying, “It’s not how you start, it’s how you finish,” doesn’t always ring true, but for Erin Roach, 21, it rings true between the gutters of the 90-foot-long bowling lanes. Roach originally had no desire to play sports at Missouri Baptist University, but a few seasons later and she is a collegiate bowler. In fact, human services and psychology was not interesting to her as a major. So, with no interest in bowling or her major, what captured her attention at MBU? “Coming to MBU I really thought the people were kind and that they cared for me. It was a good step coming from such a small town,” said Roach, who came to Missouri Baptist University from Johnston City, Illinois, in fall 2015. 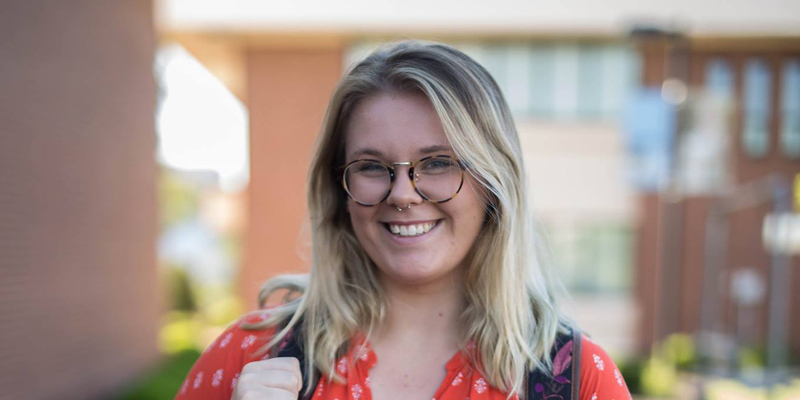 Soon after starting at MBU, Roach realized she needed a way to pay for more of her schooling, and she heard about the bowling team from a friend. “I came here on an academic scholarship, but I got connected with the bowling team and having bowled in high school I tried out and made the team,” said Roach. The team would soon be the financial opportunity and ministry outlet Roach was looking for, but not immediately. “First year with the bowling team was very difficult. I felt the team had a negative view of life and God. Over time, though, I have been able to bond with my team and see it grow into a real community,” said Roach. Roach, who became a Christian at the age of 13, immediately began viewing her team as an opportunity. “A lot of people at MBU come here for sports. Most are playing for a scholarship and athletes often stick with other athletes, so the opportunity to enter into that environment and be a light is crucial for those athletes if they are going to be in a relationship with Christ,” said Roach. Apart from ministry, Roach has also managed to be competitive, bowling a high score of 260, although not in an official game, “which is a few strikes from perfect,” said Roach. Bowling a score that is just 40 pins shy of a perfect 300 game is pretty big, but not Roach’s biggest. While Roach’s time with the team is over, the conversations and hope she shared will hopefully continue on in her teammates. “Erin has always been intentional about reaching people with the Gospel. No matter when or where, the people around her are bound to hear about Jesus whether that be through testimony, humor or compassion,” said Clayce Fletcher, a close friend who is pursuing the same degree as Roach. Her teammates, the people she wanted to reach, feel the same. “Erin always had a positive attitude while at practice or at a tournament. She also made sure that she said a prayer before a tournament. Erin’s favorite pin is the 5 pin,” said Karissa Corbin, a former teammate. The MBU bowling team closed their 2017-18 season ranked 14th out of 66 teams. Matt Williams, Staff Writer of MBU Timeline, is a sophomore pursuing a major in communication studies as well as a minor in Journalism. Matt is the founder of the not for profit corporation Matt’s Hats. Matt is an avid health food junkie and Steve Jobs fanatic. He hopes to work with companies in their marketing and communications department. His real passion is found in building meaningful company brands, that help people in their everyday lives.